First Edition Lock and Key die set. First Edition flower die set. 1. Print the free Valentines gift bag template, score on the lines shown. 2. Use a strong tape to stick the tabs and make the gift bag. 3. Use the red spot paper to cover each side of the gift box. 4. Close the flap and punch two holes in the top all the way through the box. 5. Die cut the corner doily die and adhere using the Dovecraft ultimate craft glue. 6. Die cut some of the First Edition die flowers, using the sweet Paris papers. Use a pencil to curl the petals to add dimension. 7. Make a bow using some of the twine, adhere to the corner doily, adhere the flowers on top. 8. Adhere the smaller flowers to the side adding some gems to the centre. 9. 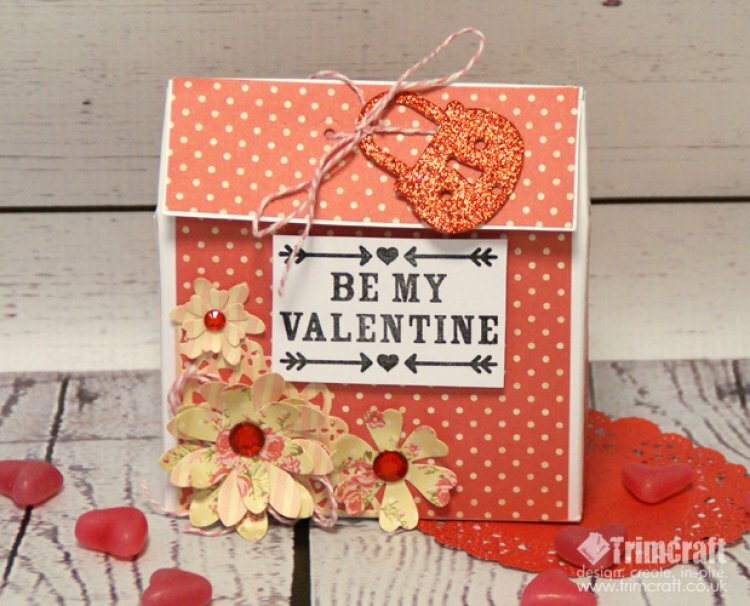 Stamp the Be my Valentine sentiment onto the white cardstock, cut out and adhere to the front of the gift box using foam pads to add dimension. 10. Fill with your treats then use twine to thread through the holes previously punched. Die cut the padlock die using red glitter card stock. Tie the twine around the lock to secure it to the gift box. Now all you have to do is fill your gift box with your Valentine’s favourite treat, what would you put in our gift box? We chose some yummy candy love hearts. Share you Valentines makes with us in the project gallery.